Yogurt, as well as being tasty, has health and wellbeing benefits – it has been proven to lower high blood pressure and reduce the risk of osteoporosis, and making yogurt at home also allows one to create a wholesome and more natural product for your family to eat, as you can choose to avoid the added sugars, artificial flavors and preservatives that commercial yogurts come with. Also, not all commercial yogurts come with live cultures which is where the probiotics are found. Those that do have the live culture gradually die of over the extended period that the yogurt can spend on the shelves of the seller. 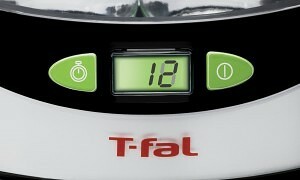 Buying an electric yogurt maker like the T-Fal YG232BUS, completely automates the process. Just add the milk and live culture mix, plug in the appliance, and turn it on. The unit will take care of the preparation for you. So is this model a good option for those looking to buy a yogurt maker? How does it stack up against the opposition? 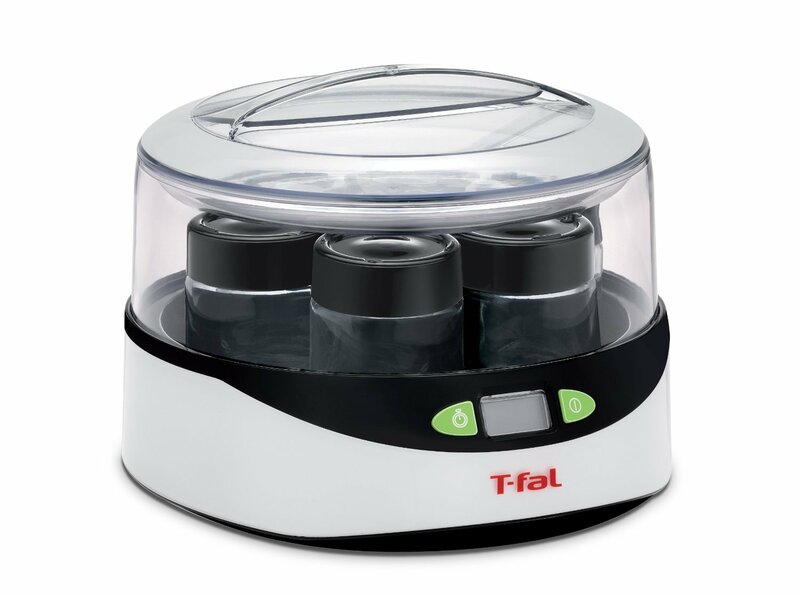 If you are looking for an electric yogurt maker, then the T-fal YG232BUS Balanced Living Yogurt Maker may be the one for you. T-fal have a prestigious history of producing kitchen appliances, and this continues their tradition. It has seven glass jars with lids, each of which hold 5.5 oz of yogurt, clever, easy to use digital controls and a countdown lcd timer. This also turns off automatically when finished to allow you to think about other things, and comes with a recipe book to start you off with yogurt ideas! It also has a one year warranty. At first look, you can see that he YG232BUS is quite a modern and stylish unit, which won’t look out of place in either a modern or classic kitchen. Cleverly, the seven individual jars mean you can experiment with flavours and don’t have to make the same yogurt in batches, which is great for those with families or just wanting to branch out. The LCD timer along with the digital controls keeps track of the time of the process, so that you can know when the yogurt is ready. The digital controls also make it easy to operate. It is very positive for most consumers that this unit is also easy to clean, due to the glass jars and black and white colour. One has to be careful though, not to move the unit during the process. Keeping in an area of low use would be very advantageous. Also because of it’s design, the upper part of the jar may be difficult to clean. Making homemade yogurt is a healthy way of enjoying the process and end results of this popular and wholesome food. The benefits of eating yogurt include it’s calcium content for healthy bones, its’ protein content especially for people involved in a lot of physical activity, and its’ probiotic contents, which contribute to beneficial bacteria in the gut. Probiotics increase the good bacteria in the stomach, which goes towards aiding digestion and boosting your immune system. It is also good for those who are lactose intolerant and cannot enjoy the benefits of milk. A simple look at the 4.5/5 rating on Amazon tells you just what consumers think of this well respected product. Due to the features or the YG232BUS, it is one of the best yogurt makers on the market, produced by a manufacturer you can trust. Despite the few drawbacks we have already pointed out. If you are a yogurt lover and want to automate the process, one cannot overlook this unit, as it has most of the features that one would like to have in a yogurt maker. I would definitely give this a 5 out of 5. This entry was posted in T-Fal.